When you purchase a wired security camera system, it will likely come with a DVR box, security cameras, and sometimes the necessary cables. However, the monitor, mouse, and keyboard (all of which are required for a wired security system) will need to be purchased separately. Unless you have these items sitting around your home, it’s important to factor the cost of these additional items when you are shopping for a system. The only way you may be able to get around this is if you were to connect your cameras to a NAS that is already managed from your computer. Your security cameras need to be directly connected to the DVR box, therefore, you will need to be creative with how and where you will run cables across your home. Where you mount your cameras and the location of your DVR box will determine the cable routes. If you are doing this yourself, there are a few things to keep in mind. Before beginning, make a plan and know the exact layout of your house. Also, find out if anything is in between your walls such as insulation or fire blocks that could potentially hinder cable runs. Map out your cable route before beginning the process, and invest in the proper tools to help you accomplish this task. Again, if you will be installing your wired security camera yourself, be prepared to get your hands dirty. If you’re lucky, you may be able to simply run cables down through the floor, across the basement, and up through the floor on the other side of the house. However, you may be required to crawl through attics and crawlspaces. With that said, wear the appropriate attire and invest in good knee pads to protect yourself. The benefit of having a wired security camera system is that you don’t need to connect it to the internet for it to work. The downside is that you cannot access it remotely when you’re away from home. 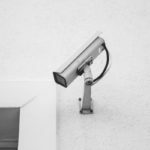 While keeping your cameras off of the internet can be a safer bet, if you want to view your feeds remotely, you may want to consider connecting your cameras to your network. If you need help choosing a wired security camera system and installing it, feel free to call 888-203-6294 or visit SecurityCamExpert.com. You can also connect with us on Facebook, Google+, Twitter, LinkedIn, and Pinterest.